If you love cooking but are tortured by the cruel, limited shelf life of fresh foods, these tips are for you. 1. Onions stored in pantyhose will last as long as 8 months. Put onions in pantyhose, and tie knots between onion. Plus it makes a freaky wall art installation! 2. Freeze green onions in a plastic bottle. Make sure the green onions are completely dry before storing or they'll get freezer burn. 3. Get an ethylene gas absorber for the fridge. A set of 3 costs $16. These little pods absorb the ethylene emitted by fruits and vegetables to keep them fresh up to 3x longer. Here's a handy list of ethylene-producing and ethylene-sensitive foods. 4. Store delicate herbs like flowers, then cover with plastic, secure with a rubberband, and refrigerate. This is the best way to keep delicate herbs like parsley, basil, cilantro, and chives fresh the longest. 5. Treat oily herbs differently. Oily herbs like thyme can be tied loosely together with string and hung in the open air. Invest in an Herb Savor. Supposedly, it'll make your herbs last up to three weeks. 7. Use a vinegar solution to make your berries last longer. Prepare a mixture of one part vinegar (white or apple cider) and ten parts water. Swirl the berries around in the mixture, drain, rinse, and put them in the fridge. The solution is diluted enough that you won't taste the vinegar. Raspberries will last a week or more, and strawberries go almost two weeks without getting moldy and soft. 8. Spray leftover guacamole with cooking spray before putting it back in the fridge. There are a number of ways to keep avocado green, and oil is one of them. You should also keep the pit in the guacamole. 9. Don't store onions with potatoes. They'll spoil faster. In a cool dry place with good air circulation, onions will last 2-3 months. 10. Store potatoes with apples to keep them from sprouting. 11. One rotten apple can spoil the bunch. It's not just an old wives' tale. 12. Add a dab of butter to the cut side of cheese to keep it from drying out. Wrap in cheese paper or wax paper (NOT plastic wrap) and then place in a plastic baggie. Keep in the warmest part of the fridge (vegetable or cheese drawer). 14. Freeze and preserve fresh herbs in olive oil. The herbs will infuse the oil while freezing, and the ice cubes are very handy for cooking: just pop one out and use as the base of a dish. Works best with rosemary, sage, thyme, and oregano. Dill, basil, and mint should always be used fresh. 16. Store asparagus like cut flowers. Sort of. Cut the stems, place in water, throw a plastic bag over 'em and refrigerate. They'll stay crisp for a week or longer, and you can use this trick on cilantro and parsley as well. See here for more details. 17. Wrap the crown of a bunch of bananas with plastic wrap. They'll keep for 3-5 days longer than usual, which is especially helpful if you eat organic bananas. Bananas also produce more ethelyne gas than any other fruit, so keep them isolated on the counter. 18. 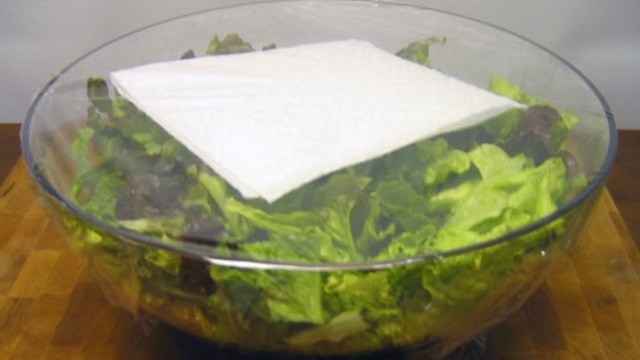 This trick using a paper towel will keep your salad lettuce fresh all week long. The paper towel will absorb the moisture. Get more info here. Also, you might want to invest in a salad spinner. It'll get rid of moisture, which is the culprit of wilting leaves. 19. Wrap celery, broccoli, and lettuce in tin foil before storing in the fridge. It'll stay crisp for 4 weeks or more. 20. Mason jars are your friend. They provide a healthier and longer-lasting alternative to plastic tupperware, which deteriorates and stains easily. Produce will keep a few days longer if stored in a jar. Once something goes bad in your fridge or cupboards, it leaves behind a nice gang of mold ready to eat up your new food. Disinfect the fridge — it'll make everything last a little longer. Don't store tomatoes in plastic bags! The trapped ethylene will make them ripen faster. Unripe tomatoes should be kept stem side down, in a paper bag or single layer in a cardboard box in a cool area until they turn red in color. To ripen faster, store with fruit. The gases emitted will help ripen the tomatoes. Perfectly ripe tomatoes should be kept at room temperature, on the counter away from sunlight, in a single layer, not touching one another, stem side up. Overly ripe tomatoes should be put in the fridge, but let them come to room temperature before eating them. 23. Reuse plastic bottles to close up your plastic bags. Make sure your produce is absolutely dry before putting the cap on. 24. Keep ginger in the freezer. It grates much more easily, and the peel grates up so fine that you don't actually need to peel it. Plus it lasts way longer. 25. Roast nuts as soon as you get home from the store, then store them in the freezer. Nuts that are roasted have more flavor, keep longer, and can always be used in recipes that call for nuts, roasted or otherwise. Spread them in a single layer on a sheet pan, bake in a 350 degree oven for 15 minutes, or until golden brown and fragrant. 26. Keep mushrooms in a paper bag, not a plastic bag. A plastic bag will trap moisture and cause them to mildew. Put them in a paper bag in the fridge or in a cool, dry place.